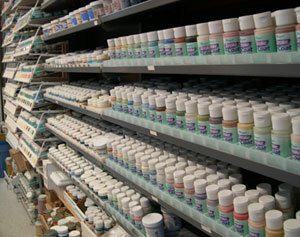 Visit our Fully Stocked Studio or Call to Order Your Supplies! A full line of supplies and accessories including glue-on eyes, Christmas Tree plastic 'bulb' inserts of various shapes and sizes and much, much more! We have greenware on our shelves or have us pour something especially for you from one of our 6000+ molds!